In mid August, my friend Charlie Smith, an ex-marine and excavator in North Carolina, got a call from a soil scientist. He said that construction workers had hit a vein of amethyst and smashed it, making the new road purple. Charlie then called me to tell me about it and ask my opinion. We immediately sent in the Marines, or rather one Marine, Charlie, to go investigate. Charlie saw that it was a large construction site and he found several pieces of nice quality elestial amethyst. We returned later that week when they weren’t working to explore the site. 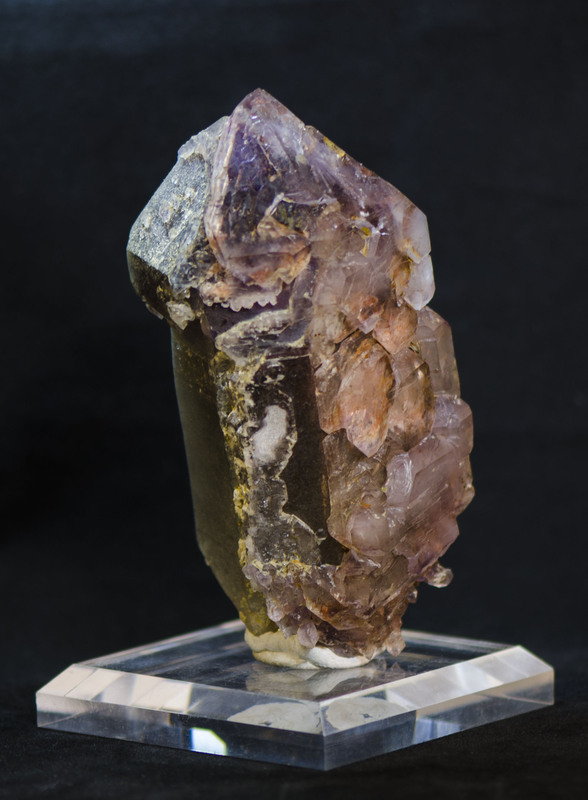 We found several quality large quartz points with secondary amethyst growth, one of them a large smoky point almost 11 inches long and 10 inches in diameter with a secondary amethyst growth. We could see a series of pegmatite veins running East-West across the site, some with crystalline formation and some without. We failed, however, to find the location of amethyst under the surface. We approached the workers there and asked about purchasing any amethyst they had picked up. At first they were going to sell us some, but changed their minds told us to go find our own. With permission granted, we proceeded in search of a vein. Later that week, we did a careful survey, digging minor trenches across the area that had the most surface amethyst showing. Whatever purple road the soil scientist was referring to had already been paved over and time was of the essence. Finally, after a long day of digging, we found a mud seam with crystals in it. We continued that evening to excavate a full pocket of mud and large quartz elestial shards and tabular crystals . The mud was sticky and hard to see. We returned home and cleaned our crystals only to find hematite included Smokey shards and the elestial growth that dominated the whole pocket. The only amethyst in our buckets was what we had found on the surface. We returned later to scour the whole site again looking for the elusive purple. While walking down a trench far from our original location, Charlie found some small popcorn micros of fully terminated amethyst crystals! Soon after we exposed the mud seem above him and we were at the beginning of our Purple Flame pocket. In the beginning the large clumps of mud we extracted were filled with micros a half inch to one-quarter inch fully terminated, some scepters and some dark amethyst crystals. Excavating around this mud seam by hand we soon found our first palm-sized elestial amethyst with mud inclusions. 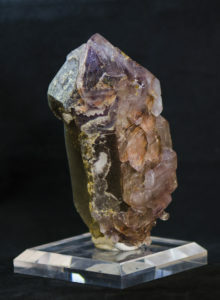 The mud inclusion within the purple crystals displayed a brilliant flame-like internal color. During that excavation we also found a large point that was broken mistakenly because it was embedded in all Feldspar. As the point broke we saw for the first time, a large point of deep internal purple amethyst, not just secondary skeletal growth. The next morning I got there very early and removed a large Rock that had been in our way the night before. The underside of this 35 pound rock was all skeletal amethyst growth with no fractures from its removal. Underneath this rock was a large jutting crystalline structure of skeletal amethyst. I sent Charlie the pictures and he showed up soon afterwards. We worked for hours trying to expose the edges and remove what was under this cap rock. Two and a half hours later we pulled the two large interlocking tabular crystals #3, #9 with two stages of amethyst growth and a beautiful amethyst coated smoky scepter #2. We also found two scepter heads that were eventually found to fit the 35 lb Caprock we had removed. Any breakage to this beast had been done in the pocket long before and iron and some regrowth were between the fractures. Once we cleaned out the mud from this zone we only saw small seams of mud going in different directions. Exhausted, we left with our buckets of mud and wrapped-up larger crystals. Later upon cleaning them we realized that there were numerous hematite inclusions and phantoms in these pieces, making them distinctive and beautiful. Many resembled the Brandburgs of Namibia and others more like Orange River. Days later we returned to find our site had been bulldozed, and we scoured the area and found no more signs of amethyst but only black smoky quartz looking like it came from the Colorado Rockies. Then while scouring the ground, Charlie found a piece of amethyst that I had walked over without seeing. I don’t think my eyes are what they used to be. From there we scraped the surface of what we thought we had already scraped. Happily, we found an exposed mud seam that had branched off of our original pocket. This large but partly tractor-abused mud seam had been exposed and cut in half. It had a lot more iron and produced the scepter wing of the pocket. We found numerous large and medium scepters with a lot of iron on the surface and then a secondary clear amethyst regrowth. Several of these looked a lot like the Montana scepters of Silver Bow county. One of the crystals from this pocket had sadly been hit by the bulldozer but originally was probably over 15 inches in length. We spent the rest of our day and evening cleaning out this pocket and again we thought we had reached the end of this lucky pocket, but the only thing under the mud was solid feldspar. We left knowing that this whole area could be finished with construction and built over at any point. Days later we returned to find the entire site of our previous diggings now smooth-rolled and paved except for one edge. Here, yet again, we found a mud seam with amethyst! Time was of the essence. We knew anything we left in this area would be gone within days. Using wood tools, we cleaned mud for six hours until 2:30 in the morning. The mud contained large points but we couldn’t see what we were removing in the huge clumps of thick pocket mud. The bottom layer of this pocket proved frustrating, as extra large points fell apart as we tried to extricate the mud around them. Still, when we cleaned this material, it had produced some of the best pieces of the pocket. One piece #1 was 11 inches long with a beautiful alligator elestial light-color amethsyt over a hematite-coated smoky/amethyst point. Most of the pieces from this zone were smoky or amethyst coated with hematite followed by a secondary crystal overgrowth. Several pieces had an orangish hue. Many were only on one face with the backside long ago etched or eaten away. The next time we returned the road was paved and houses were being built. We explored the surrounding land to find mostly subdivisions and no workable land. We left with the feeling that with our hand digging, we had only scratched the surface of this outcropping. Now, buried for the foreseeable future, the crystals we unearthed are all there is to represent this zone. We spent several weeks cleaning and inventorying our finds. We separated, photographed and numbered the best 70 pieces and are offering these for sale. We only kept a couple small lower end pieces for our personal collections. So these are the best of the pocket. There are also numerous specimens under 1.5 inches that will be available. Due to a lot of fragile secondary growth and earth movement in this pocket, not all pieces appear perfect. Also due to limited time we haven’t been able to clean some of these pieces as well as they deserve. We are under pressure to get these listing out before Tucson, but we will continue to add details, and fell free to request video footage. We have an exciting season in Tucson coming up! 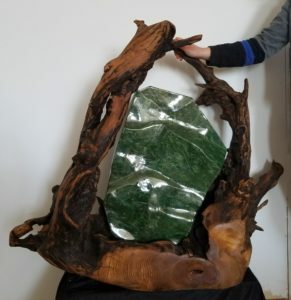 In one booth we will be display unique home decor sculptures of wood and stone. A whole new selection of turned burls, inlays, crystal lights, and free form sculptures. Our other booth will be divided into two parts. One the Southeastern U.S. including the great “Purple Flame pocket” that we dug this year in North Carolina. There will also be Graves mountain Ga. material, Hiddenite N.C. emeralds, quartz, hiddenite and others. The second part will represent southern Mexico. We have a new connection in Piedras Paradas that is allowing us to wholesale Veracruz amethyst and Concordia Andradite garnets and great prices by the flat. We also have a few unique zeolites, barites and others from this region. Although constantly acquiring and selling stock, the SFM website has been a bit ignored. Changes are at hand. We are adding specimens we have been sitting on and waiting to photograph. We are adding a wholesale options for buyers of flats of minerals. And we will be adding a whole product line of home design pieces that will debut in the 2018 Tucson 22nd street show. We just finished a major show and it was very successful. Now we have some time to photograph some specimens and publish them online. We recently made a new mine direct connection in the Congo, and we are excited about the prospects. Our representative in Namibia is currently exploring the new mine in the Brandberg area. We are also looking forward to January in Tucson and developing some mining sites in Arizona we only started to explore last year.